WASHINGTON (AP) — Diego Rossi scored three times for his first career MLS hat trick, and Los Angeles FC snapped D.C. United’s 15-game regular-season unbeaten streak with a 4-0 win on Saturday. It was United’s worst loss since a 4-0 decision against the Portland Timbers on Oct. 15, 2017. SEATTLE (AP) — Nicolas Lodeiro scored in the 18th minute, and Seattle extended its club-record start. Roldan floated a high cross toward the left side, just over the head of Salt Lake defender Marco Silva. It landed at Lodeiro’s feet, and he tucked it into the left corner past goalkeeper Nick Rimando. Until this year, Seattle had never been unbeaten through its first five games. The team’s previous best record through five was 3-2-0 during its inaugural 2009 season. 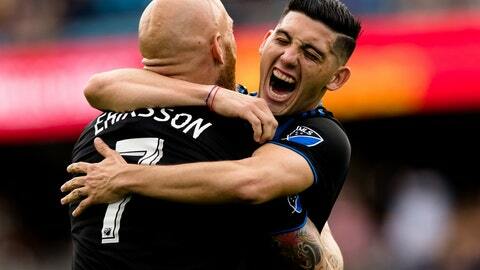 SAN JOSE, Calif. (AP) — Cristian Espinoza had a goal and an assist, and San Jose earned its first points of the season.